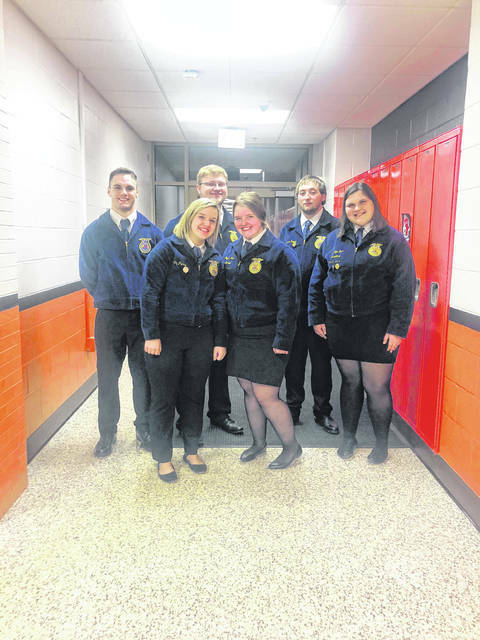 The Urbana FFA Chapter participated in the Sub-District Parliamentary Procedure Contest at Marysville on Nov. 13. Teams hold a mock meeting using parliamentary procedures. The team placed 2nd and received a gold rating, signifying moving on to the district contest at North Union on Nov. 29. The team placed 7th at district competition, receiving a silver rating. Team members are, from left, Trey Williams, Ally Pierce, Nick Crumley, Peyton Tener, Justin Preece and Ashlyn Dunn.